We understand the need to capture the moment that gives rise to a unique work of art. Our endless passion for photography spurs us on to the kind of technical innovation that raises picture quality and performance, and it keeps us looking for new ways to facilitate artistic expression. SIGMA’s ability to coordinate things smoothly on the spot is largely thanks to our unique, vertically integrated production system. Apart from a handful of processes, everything is done in house. This includes grinding lenses, molding plastic parts, painting, mounting substrates, assembly, manufacturing screws and other parts, and machining molds. All our interchangeable lenses, cameras and strobes are also produced at our Aizu factory with this integrated system. With production lines that can be ﬂexibly realigned according to a meticulous production plan and easily accommodate high-mix small-lot production, the manufacturing that takes place at Aizu is SIGMA’s greatest asset. 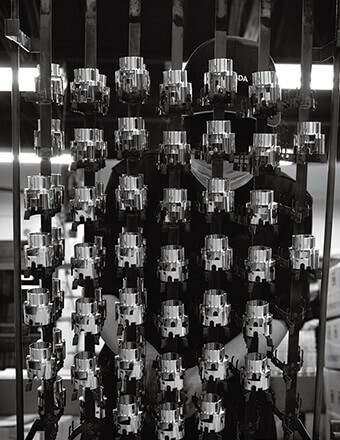 The history of our Aizu factory, our sole production base, is also the history of SIGMA itself. From the moment we first conceived the idea of setting up a factory in Aizu, we have aimed to grow and develop as a member of the local community. We believe that when a company sets up a business base, it has an economic and cultural responsibility to the local community from that time onward. The global market may be the principal focus of our business, but our attention to responsibility begins at home. Sigma Imaging (UK) Ltd is a wholly owned subsidiary of the Sigma Corporation of Japan and is based in Welwyn Garden City where our sales, marketing and administration team is located alongside our warehouse and distribution operation. The same premises house our Service Department, manned by Sigma-trained technicians, which offers technical support and repair facilities to our customers. For details on how to return a product for repair or servicing, please see the Returns page. Societies impact on the environment is an ever growing concern and one which Sigma takes very seriously. Our strict control programme over product design and manufacturing mean that all Sigma products are fully RoHS compliant, minimising the harmful effect that manufacturing may have on the environment. With the implementation of the EU’s Waste Electrical and Electronic Equipment (WEEE) directive and our continued environmentally aware product design and manufacturing programme, we can minimise any negative effect on the environment for our future. The European Union’s ‘Waste Electrical and Electronic Equipment (WEEE) directive aims to reduce the amount of waste being sent to landfill. It also aims to ensure that recovered WEEE is treated to appropriate standards and targets. August 2005. The directive aims to recover 4kg of separately collected WEEE per head of the population. product itself or on the outer packaging. At the end of its life, the product should be sent out to a designated collection facility or returned to the retailer when a similar, new product is purchased. Due to the potentially hazardous substances which may be found in electrical equipment, improper handling of this type of waste could have a negative effect on the environment and human health. Therefore, your cooperation in helping correctly dispose of such products will contribute to the environment and help reduce the unnecessary usage of natural resources. In addition to items under the WEEE regulations, this DCF also takes Car Batteries, Garden Waste, Glass Bottles/Jars (Mixed), Car Oil, Aerosols, Mixed Metal Food & Drink Cans, Mixed Scrap Metal, Mixed Paper (incl Newspapers, Junkmail, Magazines), Fridges & Freezers. If you are a business user and have a Sigma product which you no longer require and would like it collected for recycling, please click here for full instructions. Please be aware that only items sold after 13th August 2005 are included as WEEE and therefore any items sold before this date should be disposed of in the usual responsible manner. QI am a user of Sigma equipment and have a damaged Sigma lens. I want to dispose of this safely. Can I send it to you? No. Lenses are not covered under the WEEE directive so there is no obligation to recycle it. Therefore it should be disposed of in the normal responsible manner. QI am a keen photographer and have a very old Sigma ﬂashgun that I have no further use for. Should I send it to you? As the ﬂashgun was put onto the market before 13th August 2005, there is no legal requirement to recycle it. However, if you wish to help the environment, you could still take it to your nearest WEEE recycling point (Designated Collection Facility), details of which can be found at www.recycle-more.co.uk. QAs a professional photographer/business user of Sigma equipment, I understand that I can return unwanted products directly to the to you. Is this correct? No. Sigma UK do not collect or dispose of equipment directly, this is done through a separate company. Please visit www.ecosurety.com for full details on returning a Sigma product. QI have an unwanted Sigma product which falls under the WEEE scope. How do I go about getting it recycled? If you are purchasing an equivalent product, you can return it to your retailer and they will be able to arrange recycling. Otherwise, you are required to take it to a designated collection facility, details of which can be found at www.recycle-more.co.uk. QDo lenses fall into the WEEE directive? No. The DTI decided that lenses are not included as WEEE because the primary function of a lens does not require electricity. QDo my electrical camera accessories, which don’t display the WEEE logo, fall under the scope of WEEE? If your electrical accessories were purchased as a boxed kit with the camera, they are classed as WEEE. If however they were purchased separately and don’t show the WEEE logo, they do not fall under the scope of WEEE. SIGMA Imaging (UK) Ltd. is a wholly owned subsidiary of the SIGMA Corporation of Japan. We are based in the UK and import and distribute photo/imaging equipment to customers based solely in the UK. We also offer repair and servicing facilities to the same geographical area. We do not source raw materials or manufacture in the UK. Our supply chain is very direct and simple as we obtain all our products, as fnished goods, from our parent company in Japan. SIGMA Imaging (UK) Ltd. and our parent company share the same commitment to acting ethically and with integrity in all our business relationships. SIGMA’s philosophy is to demonstrate both an economic and cultural responsibility to the communities we serve and consideration for the environment. Our employees are aware of the evils of slavery and human traffcking and of the company’s attitude of zero tolerance. We expect the same high values from our suppliers and contractors. Our commitment to human rights and supply chain accountability will enable consumers to enjoy greater confdence in the SIGMA goods and services they choose.